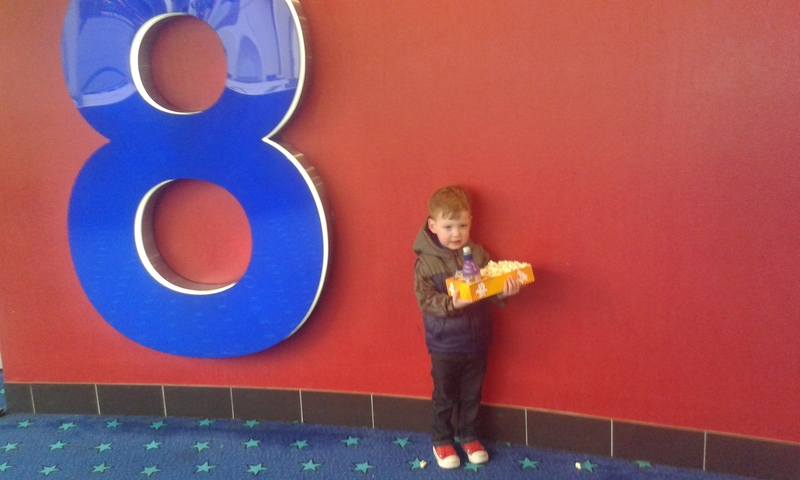 At the end of April I took D to the Cinema for the first time to see Alvin and the Chipmunks Road Chip in The Odyssey. He was beyond excited about going to see the chipmunks on the big screen! I found out a while ago about a scheme The Odyssey Cinema has with NI4Kids where they do a movie every Saturday and Sunday at 11:30 am which is a showing for children of all ages. Each week they show a children's movie for the weekend it costs £1.50 per person, even for the adults. I had said to Simon a while ago that I wanted to take D sometime. I hadn't went sooner because well I was worried about how D would behave during the film. D found the perfect place to sit while he enjoyed the sunshine and he even managed to find a small grassy area where he could run around for a bit too. It didn't take long for D's patience to break and we headed in to buy some popcorn and get our seats! As you can see it took much less time getting into the cinema when D was excited. D loved getting to see all the popcorn and watching how they scooped it up into boxes. They had a great kids box which I got one each for us and it had everything you need for a great cinema experience. It had a good amount of popcorn along with a drink and a small pack of haribo. I do think that the box could be improved with a slight adjustment. They need handles. D struggled with holding his box and being able to walk which left me trying to juggle 2 boxes of popcorn and drink while getting D to the right screen, showing staff our tickets and still keeping hold of my bag and coat. A handle on 2 sides of the box would have been ideal for him to carry on his own. D was very excited by the time we got to our screen and helped us find screen number 8 by counting all the numbers beside the screens on our way. Which lead to the photo above when we got to screen 8. D wanted everyone to see his popcorn and juice too. I plan to get this photo printed out and framed with our tickets from the day. Once we got inside D choose a seat in the first row we seen. It was roughly around the middle of the room and at a good viewing point for the screen.I wasn't able to get a great photo inside the room. He was more than happy to wait a little while on the film starting as he was too busy eating some of his popcorn. Once the screen came on and the ads for other children's films started showing D was a little confused. He kept telling me "That's not the chipmunks!" Surprisingly the ads didn't last that long and we where soon into Alvin and the chipmunks Road Chip. I didn't take any photo's during the film but we enjoyed the whole movie very much and I love that D was able to get up and dance a little without disturbing anyone. There was under 20 people in total there and most of those where other children of all ages. The volume was loud enough that you couldn't hear people talking unless they where beside you. I really liked that if D wanted to tell me something about the film (much like he usually does) then he could. The lights in the cinema where dimmed as usual but there wasn't any dark parts in the film and you could see around the room really well. I could clearly see D and I could also see many other people in the room. It wasn't just shadows moving past to use the bathroom. D loved the film and wanted to go see another one right after. I was pretty surprised that he stayed engaged through the whole film and really enjoyed himself! On our way home after the film we crossed over the new bridge in town where I got this picture of D. The weather had taken a rather dramatic turn while we where watching the film. 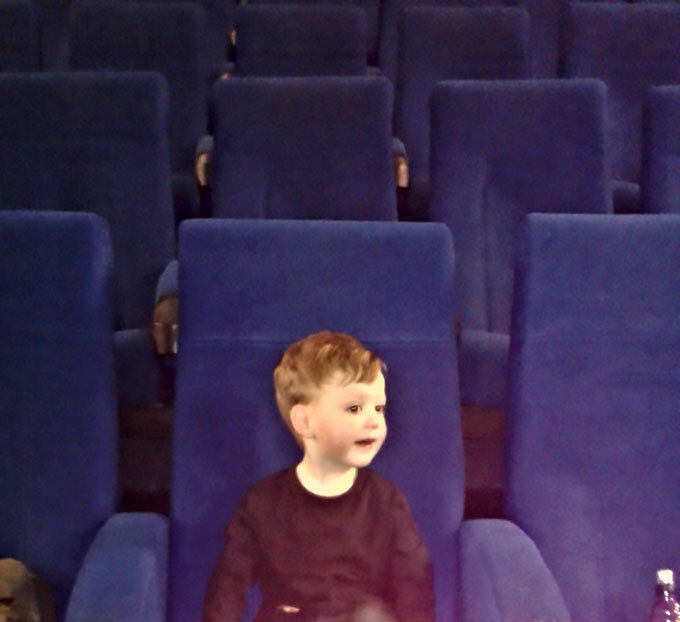 I have to say that after not going to the cinema in the 3 years since D was born it was a wonderful experience to go with him. The Odyssey Cinema kids club is such a great idea! It is the perfect setting for children and their parents to enjoy a good film and cinema experience as a family. There are some other cinemas around the UK which offer similar programmes for children and families too. If you would like to find out more about the current films available for the kids club at Odyssey Cinemas you can click on the link above. Aw he looks so happy! It sounds wonderful - I'll have to take Caleb sometime! Looks like he had a great time! 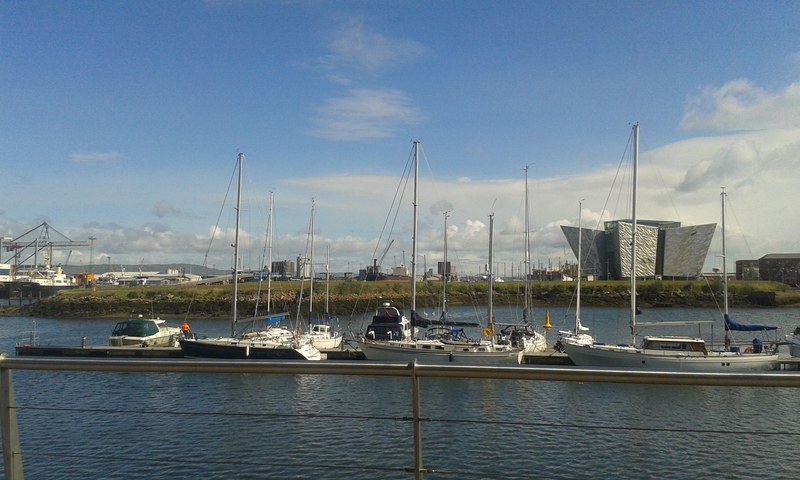 Went here on my trip to Belfast last year...so cheap compared to London prices! What a lovely post. You've got me wondering why I haven't been to the cinema for many years as I loved it when I was a child.